For an early -season meet, the annual Classical Classic has often produced some stellar performances by our Rhode Island athletes. It was status quo at this past Saturday's meet. Here's a sampling of what transpired at Mount Pleasant's Conley Stadium this past weekend. Classical's Connor Murphy certainly proved he should be considered one of the favorites to win the state 800-meter title. Murphy won the individual title convincingly at the meet with a fast time of 1 minutes, 55.91 seconds. If that performance wasn't impressive enough, how about the second-place finisher? Only a freshman, Saint Raphael's Darius Kipyego cracked two minutes with a PR of 1:58.48! How about the boys' 1,500m? La Salle's Joseph dos Reis, the state indoor champion, had to rely on his devastating kick once again to pull this one off. The Ram junior held off East Greenwich's Jeffrey Pederson with a winning time of 3:59.44. Pederson, our state cross-country titlist this past fall, was timed in 3:59.98. Finishing third was North Kingstown's Sam Toolin in 4:01.52. The time by Toolin tell us that maybe the Skipper junior is coming close to the level that made him one of the nation's top ninth-graders two years ago. Stay tuned. When it comes to the hammer in R.I., Ponaganset's Gianna Rao has been our No. 1 girl since last year. Whatever meet she competes in against her state rivals, the results have always had Rao at the top. It still could remain that way for the rest of the season, but it appears she may have a new competitor that could give her a challenge. At this past weekend's meet, Rao earned her customary first-place medal with a toss of 179-10. But also joining the 170-foot club was Barrington's Annika Kelly. The younger sister of former all-stater Adam Kelly had a career best throw at the Classical Classic by securing her runner-up spot with a distance of 173-10. That toss moves Kelly into the No. 7 spot in the country. Speaking of the hammer, how about the boys this year? By the looks of it, the state meet could come down to two standout throwers vying for the gold - Lincoln's Garrett Doyle and Classical's Jacob Furland. Once again, the talented duo battled it out inside the circle. This time it was Doyle that got the best of his rival, winning with a heave of 207-1. Furland, the defending state champion, took runner-up honors with a distance of 204-5. Cumberland's Chris Choquette and Chariho's Mitch Morin produced the closest race of the day in the 110m high hurdles. Choquette, the two-time 55m HH state titlist, out-leaned Morin at the line, winning with a time of 15.09, just .006 ahead of his rival. Expect more nail-biters from these two standout hurdlers. Keep an eye on Bay View's Aliya Barrows. Last year's state runner-up for 400m was a double winner at Saturday's meet. She won her specialty in a state-leading 58.62, beating Westerly's Helena Hall-Thomsen, who also cracked a minute at 59.93. Barrows also claimed the 200m title in 26.23. 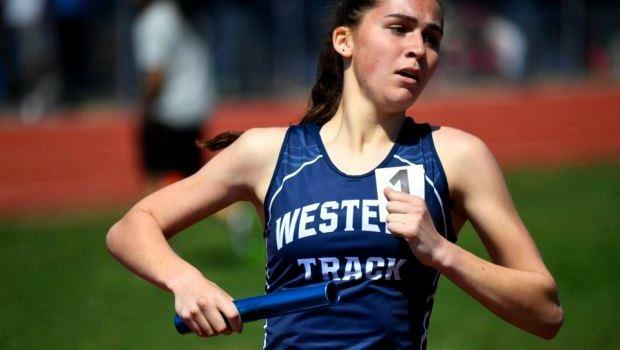 Westerly's Randi Burr continued to show her value for the Bulldogs, winning the 3,000m in 10:25.11, 28 seconds ahead of her closest competitor. She also ran a leg on her team's first-place 4x800m squad that was timed in 9:43.17. East Greenwich's quartet of Colin Cianciolo, Quentin Viera, Dante Prosseda and Cebastian Gentil dominated the boys' 4x800m with a sub eight-minute time of 7:58.46. Unofficially, Gentil posted the fastest split among his teammates with a time of 1:55.